WASHINGTON (AP) — A senior State Department official asked the FBI last year to help reduce the classification of an email from Hillary Clinton’s private server, according to FBI investigative files made public Monday. It was to be part of a bargain that would have allowed the FBI to deploy more agents in foreign countries, according to the files. It was not immediately clear whether the State Department official or someone at the FBI first raised the prospect of a bargain over the email’s classification. But the FBI said Monday it was the now-retired FBI official who first asked Kennedy about deploying more agents overseas. The State Department said the same. The FBI ultimately rejected the idea, which would have allowed the State Department to archive a message related to the 2012 attacks on the U.S. diplomatic compound in Benghazi, Libya, in the basement of its Washington headquarters “never to be seen again,” according to the FBI files. The email described reports in November 2012 that Libyan police were arresting suspects in the attack. It had been forwarded to Clinton’s private email address by Jake Sullivan, one of her top aides and the department’s director of policy planning, who was using his government email account. Republicans seized on the report as collusion within the Obama administration to protect Clinton, now the Democratic presidential nominee. “CORRUPTION CONFIRMED: FBI confirms State Dept. offered ‘quid pro quo’ to cover up classified emails,” read a tweet from Team Trump, retweeted by the candidate. Clinton spokesman Brian Fallon said the campaign had never been part of any such discussion about email classifications. Kennedy was a close aide to Clinton during her tenure as the nation’s top diplomat between 2009 and early 2013. He had served in his position since November 2007 under President George W. Bush. “Although there was never a quid pro quo, these allegations were nonetheless referred to the appropriate officials for review,” the FBI said in a statement Monday. The State Department said Kennedy had been trying to understand the FBI’s classification decisions. “This allegation is inaccurate and does not align with the facts,” department spokesman Mark Toner said. He added that there was never an increase in the number of FBI agents assigned to Iraq as a result of the conversations. The disclosure was included in 100 pages the FBI released from its now-closed investigation into whether the former secretary of state and her aides mishandled sensitive government information that flowed through the private mail server located in her New York home. The FBI official who spoke with Kennedy was not involved in the investigation of Clinton’s email use, the bureau said. According to the account in the FBI records, Kennedy proposed using an obscure provision under the U.S. Freedom of Information Act to keep the existence of the classified document from becoming public. By labeling the email unclassified but exempt under the federal records law, the State Department would have avoided criticism that its employees had mishandled classified files but still would have prevented the email’s public release. The provision cited in the FBI files, known as “B9,” is intended to protect geological and geophysical information and data, including maps, concerning wells and is the most rarely used FOIA exemption. 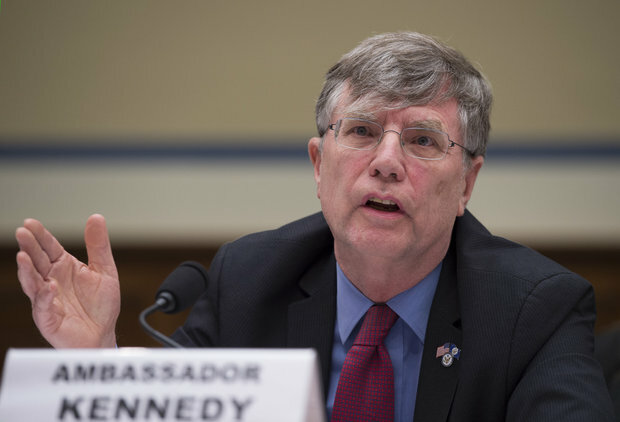 The FBI official said that after learning later that the information in question concerned the Benghazi attacks, he contacted Kennedy and told him there was “no way he could assist” with declassifying. Toner suggested that Kennedy may not have raised the “B9” exemption at all, but rather “B7” — a separate exemption protecting confidential communications with law enforcement. Toner said that exemption could have still allowed parts of the document to be released. Toner also denied there was any proposed deal, saying the FBI official first raised the number of bureau personnel approved to be in Iraq at the end of the phone call as a separate issue. The Associated Press reported the existence of the secret Benghazi-related email in May 2015, though the classified content of the document has never been made public. At the time, administration officials acknowledged interagency disagreements about whether certain information in the emails was classified. “Those who receive classified intelligence should not barter in it — that is reckless behavior with our nation’s secrets,” said House Oversight and Government Reform Committee Chairman Jason Chaffetz, R-Utah, and House Intelligence Committee Chairman Devin Nunes, R-Calif., in a joint statement. Chaffetz first disclosed the alleged quid pro quo in an interview with Fox News on Saturday.